For most runners, just making it across the marathon finish line can be seen as a huge accomplish. 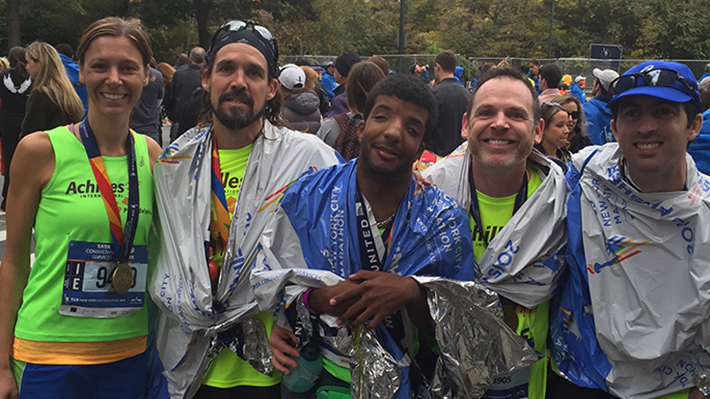 But for LeBow sophomore Kinzey Lynch, who was born with a visual condition that severely limits his vision to light, shadows and colors, it was not enough to just complete the 2015 TCS New York City Marathon. He completed it with flying colors. Kinzey finished the race in just 4 hours and 22 minutes and placed 30th in his age group, finishing in the top half of the over 50,000 runners to cross the finish line. Despite his great placement, he was unhappy with his final time. He joined three other runners from Philly Achilles and chapters from around the world to take on the course that went through all five New York City boroughs. He said the thousands of fans cheering him on, which included his parents, helped him keep going. He began his preparation for the race the prior winter when he found out he would be running it. His training kicked into high gear over the summer, with a regimented schedule, cross training and a strict diet. Kinzey stuck with the tough training schedule even after he started his first co-op in the fall, working in market research studying customer satisfaction at PECO. While he admits the New York City Marathon was one of his hardest races he’s done, it was not his first marathon. Kinzey competed in the 2014 Chicago Marathon and ran the full Philadelphia Marathon in 2013. He has also completed the Philadelphia Broad Street Run three times. A little over a month after the New York marathon, he completed the Philadelphia half marathon with his father. Kinzey began running in middle school as part of the track team and joined the cross-country team during his freshman year at Perkiomen Valley High School. Being a part of the race wasn’t always easy for him, but he persisted. “I kept showing up to practice so eventually they had to do something,” he says. “The coaches would have to run with me or have other students do it.” Eventually he found a guide, the husband of one of his high school teachers. While his coaches and teammates accepted him, competing at the high school level was another hurdle for Kinzey. During his junior year he found the Achilles International organization. Their mission is to lower barriers for people with various disabilities to participate in mainstream sports. With the help of volunteers from the organization, he was able to increase from 6 to 13 miles in just two months. He credits the organization with helping him be able to run marathons only a few short years later. For Kinzey, the hardest part of running has nothing to do with his visual impairment. He struggles with the same challenges as all runners – developing the endurance to make it to the end of the race. Kinzey received significant news coverage over the past few years because of his running, with stories by the Drexel University student Newspaper, Philadelphia Magazine, Philly.com, 6ABC, CBS Philly and U.S. News and World Report. Learn more about Kinzey Lynch in his own words in his interview with Dean Frank Linnehan. Drexel LeBow junior Ryan Lange is the youngest runner ever to complete a race of over 200 miles. The general business progrma is for students seeking broad exposure to many areas of business. This field of study is ideal for those students who want to leave themselves open to many career choices within business.